The topic of animal research and if it’s ethical or not has long been debated. Is it beneficial to progressing or do the risks outweigh the rewards? Below we take a look at the definition of animal research, the varied opinions on animal research ethics, important cases in history, threats to researchers, statistics and alternatives to animal testing. 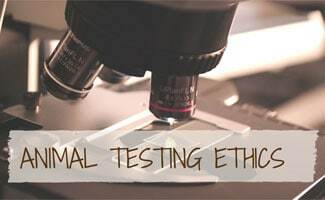 When looking at the topic of animal research ethics the term “animal research” indicates testing being performed on a variety of animals. Synonyms include: animal experimentation and animal testing. The purpose for this type of testing is to assess the safety and effectiveness of any number of substances before making them available for human consumption and use. Most commonly animal testing is mentioned in regards to cosmetic testing, toiletry testing and medication testing. Over the years, the numbers of products that are tested upon animals have dwindled rapidly as the anti-animal testing movement has grown. As the general public has become more aware of the horrors of some animal testing facilities, many more questions have surfaced. For example, what species of animals should research testing “ethics” apply to? And what procedures and products should be researched on animals first? You could argue that most believe while undesirable, it is still necessary. Most commonly the use of animal testing is approved as long as the number of animals used and the suffering of those animals is minimized. Certain organizations and countries have placed their own limitations on animal testing to modify this viewpoint. An example of this is Britain where the government requires that companies testing on animals should weigh the gain in knowledge from animal testing against the cost the testing will have on the animals being used. In other countries like South Korea, China and Japan, medical schools build monuments in honor of the animals give their lives to medical research. More extreme rulings have been made in countries like New Zealand and the Netherlands where invasive experiments on some classes of non-human primates have been outlawed completely. Tom Regan, an American philosopher who specializes in animal rights theory proposes that animals have moral rights and as living beings they have beliefs and desires. Regan does believe that there are differences between killing humans and killing non-humans and agrees that in order to save a human life it is acceptable to take a non-human life. Those who take the moral dilemma view believe that avoiding the benefit of animal testing for humans is unacceptable. The dilemma comes in balancing the harm done to the animals being researched upon versus the harm to the humans if the research is not performed. Individuals that take the abolitionist view believe that there is no circumstance that can justify harmful research on animals that does not benefit the animal being tested on. American philosopher Bernard E. Rollin specializes in animal welfare and professes that there is no benefit to human beings that can outweigh the suffering caused to animals being tested upon. In addition Rollin states that human beings have no moral right to use animals in ways that do not benefit the animal itself. Peter Singer is another popular voice in animal research ethics. An Australian philosopher of bioethics at Princeton University, Singer believed that in utilitarian moral considerations there are no grounds to decide whether suffering is important based upon an animal’s species. In 1985 the nation saw the enactment of the Animal Welfare Act amendments. It also saw the birth of a macaque monkey named Britches. Britches was the subject of a sensory substitution device experiment at the University of California in Riverside. After his birth the monkey was taken from his mother and left alone with his eyelids sewn shut and a sonar sensor on his head. The device was part of an experiment in the development of sensory substitution devices for the blind. So severe was the experiment though that when the Animal Liberation Front heard of it they raided the laboratory on April 20 and rescued Britches as well as 466 other animals. In addition to animal liberation, the group also caused some $700,000 worth of damage to laboratory equipment. The group claimed the university was mistreating the animals in their lab, but after the event, a university spokesman denied these allegations and indicated that the group had caused long-term damage to its research. After an eight month in to the investigation the National Institute of Heath concluded that no corrective action was required. A number of prominent universities and researchers have been forced overtime to close down their labs and abandon their research as a result of threats. One researcher in particular, at the University of California in Los Angeles was forced to shut down his lab after receiving threats on his life. The researcher received a grant to research on 30 macaque monkeys in vision based experiments in which the monkeys were anesthetized for a physiological experiment and then euthanized. The researchers name, home address and phone number were promptly posted on the website of the Primate Freedom Project giving protesters direct access to him. Not only did individuals protest outside the researcher’s home but a Molotov cocktail was placed on what was believed to be the porch of a fellow UCLA researcher. The address turned out to be the home of an elderly woman unrelated to the UCLA researchers. Following this attack the Animal Liberation Front claimed complete responsibility for the act. Threats like those experienced by researchers at UCLA and their families are not unheard of. There have been a number of other violent attacks on animal researchers regardless of how well unintentional their actions are. As a result of these threats, many animal researchers have focused on pursuing other avenues of data collection instead. Currently researchers that still turn to animal research for a number of reasons try to do so minimally and with a few guiding principles in mind. Reduction – Encouraged to reduce the number of animals that are used in their research or to increase the amount of information gained from the same number of animals. Replacement – Pushed to use non-animal testing methods instead of animal testing methods whenever it is possible. Refinement – Prompted to refine their methods of research in order to reduce pain, suffering and distress that animals may experience during research. It is also important for researchers to be able to improve the welfare of animals that are still being used in research. Is animal testing a necessary process? The question remains unanswered with individuals on either side of the fence screaming evidence for their beliefs. There are however, a number of alternatives to animal testing that should be considered by researchers. Positron Emission Tomography (PET) – PET is a scanning process that allows for the scanning of the human brain while the subject is still living without any intrusive interference. Comparative Epidemiological Studies – Other researchers are turning to comparative epidemiological studies of disease risk factors throughout the human population. The Use of Invertebrate Animals in Research – Some individuals advocate the use of some invertebrate systems rather than using vertebrates in early research. The concern with this type of substitution is not only the significant difference between vertebrates and invertebrates, but also the fact that creatures are still being researched upon. This video examines some of the shocking statistics about animal testing and actions you can take if you are moved to do something about it. What is the Future of Animal Testing? As more companies shy away from animal research, more move towards investigating stem cell testing. There are those that argue that using human cells to research human drugs and illnesses is a step in the right direction both because “at least we are picking on our own species” and it’s researching on human cells for human information. The vast majority of people however, argue that stem cell research is just as bad if not worse than animal researching because they believe it is creating a life for the purpose of research. There is no “right” answer when it comes to animal testing or stem cell research, everyone has their own opinion and for those people their opinion is the right choice. Certainly it is a tragedy to take a life or inflict pain upon any living being…but is that tragedy as bad if it is done with the purpose of curing a life threatening disease? The answer to that question depends upon who you ask and unfortunately how that matter concerns the individual asked. How do you feel about testing performed on animals? It seems like with technology there would be a better way that they can test products without harming animals or using stem cell research. Perhaps there will be robotic testing in the future?